Its crazy busy around here! With birthdays, parties, friends, school events, traveling, being a parent, kid homework, and baking for my husband I'm running from one place to the next. I’ve been opting to take some shortcuts in the kitchen lately rather than hauling the family off to McDonald’s for dinner, much to my 8-year-old’s chagrin. 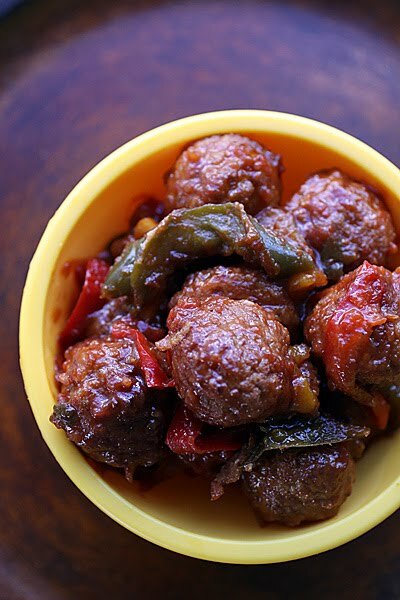 The cranberry flavor in these sweet and sour meatballs makes for a nice fall meal. Everything went into the slow cooker in just a couple minutes, enabling me to carry on with my insane schedule. These meatballs were served over rice for my family, but they’re nice as an easy appetizer on their own for parties and potlucks. 1. Add the cranberry sauce, chili sauce, a pinch of salt, some pepper, and a dash of red pepper flakes to taste to a pot and bring to a simmer. Stir often and turn off heat when the two sauces combine. 2. Place the frozen meatballs, frozen peppers, and sauce mixture into a slow cooker and cook over low heat for about 6 to 7 hours or on high heat for about 4 to 5 hours. 3. Serve over rice if desired. I remember making a similar sauce for cocktail meatballs when I was first married but it had grape jelly instead of the cranberry sauce. Nobody suspected the recipe and everybody lapped them up. You're so right - much better than going to McDonald's. This looks great!! Another one I'll put on my cooking bucket list to try! My girlfriend made something similiar, only she used grape jelly in the meatballs and it was delicious! Great recipe Laura! Fast, simple and absolutely delicious! I bought, today, all the ingredients for this. Actually bought cocktail-size meatballs to serve as an appetizer. Can't wait. Thank you. oh boy do I remember this dish at a christmas party I went to years ago. these meatballs were so flavorful and unique. I must try these. Wow! These look as though they are packed with flavor....this time of year it is nice to have a quick and easy up one's sleeve! Thank you! I am going to give it a try. I have had something similiar as an appetizer and enjoyed them, what a great idea to turn them into a dinner over rice!! Sounds way better than a big mac!!!!!! Delicious! Great recipe. perfect for the holiday! Love it. Thanks for sharing. We all need delicious and easy to prepare recipes like his that are health compared to fast food! Especially now with Christmas around the corner when eveything will go crazy! You just gotta love the crock pot!!! Very interesting recipe. Have you seen "Melange a Troise" pepper mix at Trader Joe's? Bell peppers... love them. I have a freezer full of sweet peppers from a friend's garden this past summer. Might have to track down the other ingredients and give this a try! What a fabulous easy, quick, and tasty recipe! I love easy, quick and tasty! Yum! This sounds so good...and too easy not to try it :) Thanks! Yes, it is such a crazy and busy time of the year. These meatballs look so appetizing and are a very creative combination. Good for you for not succumbing to fast food and opting for the slow version. This slow cooker meatball recipe is a keeper! Perfect for a crazy busy weeknight. Thanks for sharing. what a great idea to put cranberry sauce in for the sweet part. I might have to make this for our christmas eve dinner (we do a quick easy meal and save the fancy dinner for christmas night). Cranberries probably give the meatballs a real zest. I will need to try this. These meatballs look very good! I hope you have a great Thanksgiving! Hi neighbor! :) I decided to follow your blog so I can see immediately when a new recipe pops up. Everything I've tried so far is delish. I happen to know your purple pizza was a big hit in south central Montana. And today I see something for the crockpot - oh, yum! These look so flavorful and delicious! Wow! Beautiful! I love the fruit with meat and cranberry is so my fave! What a brilliant way to use left over cranberry sauce! I made a citrus cranberry sauce for thanksgiving, I love having it alongside my stuffed french toast for breakfast....but these meatballs! Yummy! Simple but yet tasty. I love meatballs! I made these for our family's Christmas Eve party using Italian meatballs (by mistake) and fresh peppers. They were incredible and I got several recipe requests. We arrived late at the party due to the weather and even though everyone had already eaten, there were only a few left at the end of the evening. Most people remarked on the addition of the peppers, and I have to agree that it makes the meatballs something special! Thanks for sharing yet another of your fabulous recipes.